Kohl's pricing is tricky - they're usually more expensive than other stores, but run promotions regularly that change the actual cost of the item. 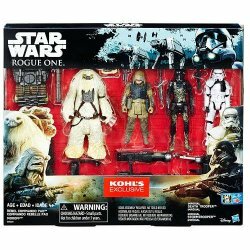 This year, they've got a swell Star Wars Rogue One Battle 4-Pack Figurine Set with a normal going rate of $49.99. Today, the base price was $34.99 when I placed my order not 10 minutes ago, and as of right now it's $39.99. It may well move again. I used the codes USA10 and VETERAN to get it down to under $25 with free in-store pick-up and sales tax - but again, that pricing seems to change, so be careful when checking out and check the coupon code sites. But why is this set different enough to make you mad? Two of the four figures are troopers with unique deco - I don't have it in my hands yet, but I can tell you that the Death Trooper has beach sand on it, and the Sandtrooper's pauldron is a unique color. Moroff and Pao are not immediately obviously different. With any luck next year they'll give us a set with four unique figures - last year, they gave us a set with bonus green weapon accessories exclusive to the set. I would argue this is better.